BEN WATTENBERG: Suppose you had a mountain of money. Would you buy a mansion, a nice car? Or maybe your tastes would lead you to wine, women and song? Or to making an even bigger pile of money? But you know, these days, very rich Americans are giving away much more money than before, raising questions, and likely leading to a new philanthropy. Let's find out. NARRATOR: Funding for this program is provided by . . .
T. Rowe Price Associates, an investment management firm providing mutual funds, brokerage services, and retirement plan services. T. Rowe Price, invest with confidence, T. Rowe Price Investment Services Incorporated. At Pfizer, we're spending five billion dollars looking for the cures of the future. We have 12 thousand scientists and health experts who firmly believe who firmly believe the only thing incurable is our passion. Pfizer. Life is out life's work. Additional Funding is provided by...The Lynde and Harry Bradley Foundation, the John M. Olin Foundation, the Smith Richardson Foundation, the Bernard and Irene Schwartz Foundation . . .
Hello, I'm Ben Wattenberg, moderator of Think Tank. You know, until recently, when the stock market was in the stratosphere, it seemed as if very rich people were a dime a dozen. Many of them were very young, some of them very arrogant. Then the market took a dive and the financial headlines were about how some of these very rich people were dead broke, or in big debt. Pity. But this boom and bust cycle masks something even bigger. America is awash in a tidal wave of wealth. And the more money Americans have, the more they give away to charity. 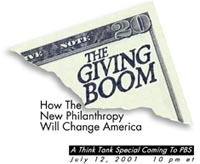 This is leading to a "Giving Boom." Let's look at this trend, check some history, and explore some of the ideas in play. Let's talk to some people trying to make this philanthropy work, and to some critics. Narrator: There are at least three big reasons for the growth of wealth in America. First, it's been 50 years - a half century- since we have had anything close to a long-term, major recession or a depression. Second, following the Depression and World War II, there was a baby boom in America that brought forth 76 million Americans who are today in their most productive and wealth-producing years. Third, net worth - that's the combined value of all the stocks, bonds, houses and other property - has exploded. The total net worth of Americans has gone up from $7 trillion in 1950 to $38 trillion in 2000. Of course, many Americans still struggle to get by but this growing affluence has made most Americans richer and some Americans extremely rich - prime candidates for big-time philanthropy. Paul Schervish and his colleague John Havens at the Social Welfare Research Institute at Boston College believe that the wealth we are seeing today is only the beginning. This great wealth that we're projecting has the potential to lead to a golden age of philanthropy. And I don't mean a golden age of philanthropy simply quantitatively, as if there will be large amounts of money available from philanthropy, although that is part of it. It can be a golden age of philanthropy because people are paying attention in a more rigorous way, in a more caring way, to actually how to use those philanthropic dollars to pay attention to the true needs of people. NARRATOR: The richest American households account for the biggest proportion of philanthropy. 46% of individual contributions to charity comes from families worth more than $1 million dollars. An additional 25% of gifts comes from families worth between $200 thousand and $1 million. As those families become wealthier, more money will go to charity. The big story is what may be called the emergence of the mass affluent class. You can look at millionaires, for example. In 1980, there were approximately 700,000 families, about three million people, who lived in a millionaire household. A household with a net worth of $1 million or more. Today, five million families, 20 million people. So what we have seen is that wealth, which was once the preserve of a sort of aristocratic few, has now become a mass phenomenon. NARRATOR: Who gains from this? Of course, all of the standard philanthropic staples: churches, colleges, the symphony, museums, medical research, and of course, the folks who ask for your pledges for public television. But there may be more to it. Video: Ben Wattenberg: ". . . number two was childbirth." PAUL SCHERVISH: We have been interviewing a number of wealth holders who are what would be considered part of the new economy and the new philanthropy. Increasingly, as wealth holders are younger when they accumulate their wealth, have fewer heirs and actually envision a period of time in which their substantial wealth that they've gotten when they're young will grow, they're starting to give increasing amounts from their pool of wealth while they're alive rather than simply waiting until they die in order to put it in the form of bequests. NARRATOR: If you look back over the past 20 years, individuals gave more than $2 trillion dollars to charity, both while living and through their final estates. Schervish and his colleagues are projecting that in the next 20 years the total going to charity could grow to more than $6 trillion dollars. And just look at what happens if giving grows at that rate out to the middle of the century - $34 trillion dollars. Hey, that's a lot of zeroes. And they raise questions. How will all this money be used? Is it such a great idea that some people have so much money? Big questions, but not new questions. Bill Gates was not the first young person to earn a lot of money. The numbers that Paul Schervish is projecting are in some ways an echo of an earlier "Golden Age of Philanthropy." Perhaps we can learn something about tomorrow from yesterday. We always see these wonderful old newsreel pictures of Rockefeller as this ancient, spindly little man handing out dimes and looking as old as Methuselah or Carnegie with that wonderful silvery beard that he has, and we imagine that they actually made their fortunes when they were in late middle age. And, in fact, these were the boy wonders of American business at the time. When they were in their 30s and 40s, they were fantastically wealthy. They were about the same age as all the people making fortunes today in high tech and biotech and finance. NARRATOR: The "high-tech" industries of yesteryear were railroads and steel. Riding those rails, Andrew Carnegie lived the American success story. In 1848, twelve-year-old Andrew and his family immigrated from Scotland to Pittsburgh. HAROLD LIVESAY: By the time he was 30, he could say, 'I'm rich, I'm richer than ever in my wildest dreams.' So it is a meteoric rise, and it's a relatively unusual one in terms of the amount of wealth that he was able to amass from a very modest beginning. NARRATOR: By the age of 45 Andrew Carnegie owned his own multi-million dollar company that produced steel for the railroads. Carnegie steel was an aggressive competitor, and dominated the steel-making world. That success came at a price. In 1892, the Steel union in Homestead, Pennsylvania, went on strike. A battle for control of the mill raged along the river. Seven strikebreakers and nine steelworkers died, hundreds more were injured. Carnegie blamed himself for the tragedy. As his fortune grew, Carnegie struggled with the obligation he felt to return some of that great wealth back to society. In 1889, Carnegie outlined his philosophy of philanthropy with a series of published essays later known as "The Gospel of Wealth." He wrote, "The problem of our age is the proper administration of wealth." Carnegie announced to the world "The man who dies thus rich dies disgraced," and with that statement, began systematically to give away his mammoth fortune. So now what you're going to have through philanthropy is a redistribution. Is it an effective redistribution, is it more beneficial to society than a more equal distribution might have been in the first place? Those are questions that you can't answer. But, I think they're implicit in Carnegie's thinking that he has accumulated this great wealth and with it comes great responsibility. He began building public libraries. RON CHERNOW: Carnegie goes to municipalities across the country and around the world and he offers them a very simple proposition. He says, "I will build you a beautiful masonry building, but in exchange you have to give me a central site, you have to agree to stock the building with books, and then you have to provide for their upkeep." So it was really a very elaborate form of matching grant. He did it 2,800 times with phenomenal success. NARRATOR: But even 2,800 libraries barely put a dent in Carnegie's fortune. In 1901, at the age of 65, he sold the Carnegie Company to J.P. Morgan and the newly formed US Steel Corporation. Morgan reportedly said to Carnegie, "Congratulations on being the richest man in the world." HAROLD LIVESAY: At the point at which he decided to sell Carnegie Steel to United States Steel, this is a guy who owns a controlling majority of the largest steel firm in the world that produces more steel than the entire country of Great Britain. He owes nobody any money at all. He winds up with $280 million in five percent gold bearing bonds that is absolutely every nickel of it his to do whatever he pleases with. That kind of wealth and power is pretty rare, and very few people have it today. NARRATOR: Carnegie's fortune grew faster than he could give it away. At it's peak, Carnegie was worth more than $6.7 billion in today's dollars. And he had no choice, he felt, by 1910 than to transfer the bulk of what he had left into what we know now as the Carnegie Corporation. NARRATOR: The Carnegie Corporation was the super-trust of his philanthropies. Its endowment continued to support many of the causes Carnegie endorsed during his lifetime: it and was designed specifically to fund the foundation's activities in perpetuity. Over the years, the concept of a perpetual foundation has come under fire; after all, what guarantee is there that the general will or intent of the donor will be carried out by an independent board, two, three or five generations after the donor's demise? Carnegie nearly lived up to his motto that "the man who dies rich dies disgraced." By the time of his death in 1919 Carnegie had given away nearly 90% of his fortune. Of course, that left 10% for his heirs, which was more than just chump change. Carnegie's only competition for the title of richest man in the world, was a quiet, intense, Baptist, named John D. Rockefeller. He founded a little company called Standard Oil and by 1869, at the age of just thirty-one Rockefeller controlled 90% of the oil industry. RON CHERNOW: By the time that Rockefeller was in his 40s, he realized that he was amassing so much wealth that he would have to graduate from what he called retail philanthropy -- that is, giving to individuals or a local hospital, local school -- to what he called wholesale philanthropy. And really one of the major revolutions that he effected as a philanthropist was to create, from scratch, large-scale institutions. NARRATOR: In 1888, Rockefeller made his first gift to create what would become the University of Chicago. Few people have the resources to create a world-class university virtually overnight. Rockefeller hoped to involve the community in giving and thus leverage his donation into an even larger gift. RON CHERNOW: Instead, perhaps predictably, in retrospect, the people of Chicago said, "Well, if Mr. Moneybags is behind the university it scarcely needs our hard-earned cash." And so what happened was that, over the course of the first 18 years of the University of Chicago, John D. Rockefeller footed an astonishing 90 percent of the bills of the entire university. NARRATOR: Rockefeller continued to pursue what he called, "the business of benevolence." In 1901 he launched the Rockefeller Institute for Medical Research, known today as Rockefeller University. RON CHERNOW: Nowadays, the idea of contributing to medical research seems very mainstream; indeed, rather stodgy and old hat. It seems like every person of means nowadays gives to research on one disease or another. But if you go back circa 1900, the idea of paying scientists to sit around and dream up discoveries and medical breakthroughs was actually considered quixotic and almost hare-brained. NARRATOR: It was the first institute devoted exclusively to medical research. Since its creation Rockefeller scientists have developed treatments for spinal meningitis and pneumonia, and made major advances in polio. But Rockefeller's success as a philanthropist failed to insulate his business empire from attack. In 1911 the Supreme Court broke up Standard Oil. Still, Rockefeller's wealth ballooned to $900 million dollars. That was more than 2% of the total American economy. In 1913, Rockefeller established the largest philanthropic organization ever, the Rockefeller Foundation. He put his son John D. Rockefeller Jr. in charge of the $250 million endowment, which has grown to $3.6 billion. The Foundation pioneered research in global health with work on malaria and yellow fever. Rockefeller grants also played a part in research that revolutionized world food production with a new strain of rice. Old John D. didn't forget his progeny. A little less than half of his great wealth was passed on to his heirs, who several generations later, are still among the wealthiest families in America. JAMES SMITH: I think there are several lessons that people can take from the experiences of Carnegie and Rockefeller. They thought carefully about what they wanted to accomplish, whether it was in building libraries, and dealing with the problems of disease. And just as people who accumulated fortunes in the late 19th century were compelled to think about their philanthropy, I think very similar conditions are compelling people to think in the late 20th to early 21st century about how they are going to organize their philanthropy as well. This application has violated system integrity? Well, at the beginning of the 20th Century, steel, oil and railroads created the massive fortunes that endowed, and changed philanthropy for the better. Now in the 21st century we have this infuriating crash-mobile and its ilk to thank for immense fortunes and the philanthropies they endow. I do find this a vexing machine, but remember, in the philanthropy game, the point isn't whether you love the way the fortune was made, but how the wealth is spent. NARRATOR: Today, Microsoft founder Bill Gates is one of the richest men in the world. In 2001, he was worth $62 billion dollars; and this 44 year- old has only begun to give away some of that tremendous wealth. The Bill and Melinda Gates Foundation is just a few years old but it's endowment has already grown to more than $21 billion, making it the largest foundation in America, followed by the Packard Foundation, the Ford Foundation, the Lilly Endowment and the Getty Trust. By law each foundation must spend at least 5% of it's capital each year, which may include it's own overhead. Some observers think that 5% is not nearly enough. So far, the Gates Foundation does better than most. In 1999 the foundation awarded more than $2 billion dollars in grants, paying out between 8 and 10% of its assets annually. About half of its grants, more than $1 billion, go to an appropriately modest issue ... ridding the world of disease. Gates Foundation Video: Bill Gates: "So our program has a simple goal, make vaccines you and I take for granted available to children regardless of where they live." NARRATOR: In 1999, the Gates Foundation spent more on global health than the US Agency for International Development and all other federal government agencies combined. Most of the Gates Foundation grants go to support an international vaccination program. Working with the World Health Organization, and other aid groups, the Gates Foundation is trying to completely eradicate polio worldwide by the year 2005. The approach is simple enough: use existing affordable vaccines to prevent polio; but the scale is revolutionary and breathtaking. The staggering wealth of Bill Gates is certainly making admirable and ambitious programs possible; but some critics wonder whether one person should command such enormous resources with little public oversight. We have a Bill Gates Foundation today that is worth almost $23 billion that no doubt will become a $100 billion foundation. And the questions that that poses, is that good for a democracy? That's more money than all but maybe 25 nations in the world have as their budget. Should they be allowed with tax incentives, our money, the public money, to decide where that huge amount will go? NARRATOR: After all, Gates' Microsoft, like Carnegie Steel and Rockefeller's Standard Oil before it, has attracted much public suspicion. In fact, throughout the century, the most aggressive businessmen are often the most important philanthropists. That same ferocity and ambition in the business world, makes possible both large-scale fortunes and large-scale giving. One of the glories and one of the shames of capitalism has always been these tremendous concentrations of wealth. There is a silver lining from the point of philanthropy, is -- which is that sometimes when you get these gigantic fortunes, you can have large-scale, ambitious, adventurous philanthropy of a sort that only kings and queens could practice once upon a time, that would be very, very difficult if the money was much more finely and equitably distributed amongst society at large. Whether that's justification or not, it's very hard to say. Who are these people of great wealth, who can shape an important part of America's agenda? Well, Carnegie, Rockefeller and Gates all made their big money when they were very young; they were all known as cut-throat businessmen who dominated their industries, which got them in trouble with the law; they were creative, ambitious, and energetic in their business - and in their philanthropic vision. Consider now Michael Milken, another man whose is shaping the agenda. To some he is a financial genius. To others he is the embodiment the 1980s so-called "decade of greed." But most all agree on this: he is a man of non-stop energy and imagination who uses these qualities to promote his own vision of philanthropy in his own way. NARRATOR: Mike Milken is a controversial figure not only for how he has given his money away, but for how he got it in the first place. While at the investment firm of Drexel Burnham Lambert in the 1970's, Milken pioneered a financial instrument popularly called the "junk" bond, more technically known as a high-yield bond. Such securities helped companies like MCI, McCaw Cellular, and Turner Broadcasting, jumpstarting what is now called the "new economy." In 1987 alone, Milken earned more than $550 million dollars. Federal prosecutors later charged that some of what he had done was illegal. A drawn-out court battle ended in a guilty plea by Milken in 1990 followed by nearly two years in prison. But long before Milken made scandal headlines, he was a very rich man and a burgeoning philanthropist. Starting in the late 1970's, Milken and his family have given away hundreds of millions of dollars. Much of that money has gone to education programs. Every year, Milken's foundation gives out $25,000 prizes to the nation's top teachers. Students cheering: Mike! Mike! Mike! Mike! NARRATOR: Milken himself is personally involved with Mike's Math Club, a program to improve the math curriculum for fifth and sixth graders. Mike Milken: "Do you know how many calculations your brain can do in one second?" Mike Milken: "Twenty thousand trillion!" NARRATOR: Milken got his wealth early in life - before he turned age 28! By 1975, I was independently wealthy, and made as much money as I've ever needed in my life. Give me some -- a ballpark area in 1975, personal wealth. Probably in excess of $100 million. Which in today's money is . . . ? BEN WATTENBERG: It's more, right. But 1976 changed my life again when I came to the conclusion that my father was going to die from melanoma. It was the first time in my life that I could not solve a problem. I visited every major cancer center, and I concluded after a year that there was not research available that would save my father's life in the time that he had left. NARRATOR: Milken says that his father's death changed him forever. In 1982, Milken and his brother Lowell started the Milken Family Foundation. Its mission was to support education programs and medical research. Woman: "To Lowell and Michael Milken . . . "
NARRATOR: Since then, the foundation has given away more than $750 million. In 1993, Milken's philanthropy again turned to cancer research. This time the target was prostate cancer. I was diagnosed thirty days after leaving prison camp. I was diagnosed the day after I left the halfway house. I actually thought I was doing everything possible for medical research and cancer research prior to my diagnosis. We were giving large grants. I was traveling around the country visiting cancer centers. But when I was diagnosed, I discovered really, I had not done everything I could have done. So at this point in your philanthropic career, prostate becomes number one. Well, surviving became number one. NARRATOR: Only months after his diagnosis, Milken pledged twenty-five million dollars of foundation money to start CaP CURE. Almost immediately, CaP CURE became one of the largest funders of prostate cancer research. Five years later, CaP CURE received another twenty-five million dollars from Milken. The Center for Human Nutrition at UCLA is one recipient of CaP CURE research money. Milken's interest in nutrition led him to Dr. David Heber, who heads the center. Dr. Heber: " Very good to have you here today. " NARRATOR: Since its founding in 1993, CaP CURE has given away about $9 million for research into nutrition and diet. Milken credits a change in eating habits with helping his own recovery from cancer. BEN WATTENBERG: Did you get into this because of your own illness? I got into it because seven members of my family have passed away from cancer. Three more currently have cancer. And I had the most negative diagnosis in '93 of all my family members. And so I said, 'Okay, what could I do different?' And they gave me 12 to 18 months to live 8 years ago; I figured I had to do it in a hurry. And one of the things I did is I stopped eating. I'm just going to eat fruits and vegetables, because I don't know what I'm doing that's hurting me. NARRATOR: Like breast cancer and AIDS, prostate cancer has gone from a disease once only whispered about to one that now gets media attention and a solid share of federal funding. Video: Gen. Norman Schwartzkopf: I was diagnosed with prostate cancer in 1995. I survived. NARRATOR: To promote prostate cancer awareness, Milken enlisted people like General Norman Schwarzkopf and slugger Mark McGuire to support CaP CURE's efforts. Raising the profile of prostate cancer is just one way Milken says he is "leveraging" his philanthropy. He isn't giving away big money like Carnegie, Rockefeller, and Gates. But he is trying new ways to put his money to work. Mike, you've said to me that the money is not the most important thing in philanthropy, and as someone whose net worth has substantially fewer zeros than your own, I find that I don't quite get it? Can you be important in the field of philanthropy for prostate cancer without having a lot of money to begin with? My mother told me a simple definition, the definition of a problem was something that cannot be solved with money. If I gave my entire net worth to save my father, I would have, but my entire net worth could not save my father, and a billion dollars could not have saved my father, and the United States government could not have saved my father. You can be important in any field of philanthropy without having a lot of money. Someone has to make the money work. Someone has to make it productive. Someone has to bring people together. NARRATOR: For cancer researchers, money - and getting it quickly - remains very important. CaP CURE has attempted to streamline the process. Before CaP CURE - and we go back now to 1993 -- the process of getting a grant in prostate cancer was a long process - about three months of writing, about six months of review by committees, and perhaps another six months until you got the funding. What CaP CURE was able to do was to put that on a fast track, to have a very short application form. The science was either worthy of pursuing or not. NARRATOR: Federal agencies fund the UCLA nutrition center with more than ten times what Milken's philanthropy contributes. But CaP CURE provides "seed money" to research at an early stage. Once a study is off the ground, it is easier to get a grant from the government or a larger foundation. So no matter what size any individual foundation is, it can do venture, it can encourage, it can start, it can jumpstart programs, but ultimately these programs have to be supported institutionally. So let's talk about how to leverage philanthropy. In your lifetime, when you're young, and the young philanthropists, when they're at the peak of their careers or the most creative, that same energy that allows them to build cellular telephone industries, or cable industries or entertainment industries, or invent the microchip, that same energy and creativity quite often can be put into leveraging their ability in philanthropy. BEN WATTENBERG: The School of the three B's. The Bible, the Bath and the Broom. Our next philanthropist, Ted Forstmann, is doing what only very rich givers can do -- setting his own agenda... and this time in a political realm. Forstmann got behind a controversial idea to fix American education by using public money to send kids to private schools through what is often called "vouchers". But Forstmann decided to bypass the whole political argument: he put his own money behind private scholarships, helping schools like Nannie Helen Burroughs here in Washington, DC. And what did Forstmann learn? That great wealth can do a lot, but not everything. Peggyann Brown: So when- the bus leaves here at 7:17? Peggyann Brown: - but you aren't going to leave here at 7:17, are you? NARRATOR: Peggyann Brown lives in one of America's poorest neighborhoods, the Anacostia section of Washington, D.C. She is raising her grandchildren, Kashaun and Kastacia, on her own. Peggyann, a hospital clerical worker, has long been committed to sending the girls to private school. These days she gets help from a local non-profit, the Washington Scholarship Fund, which provides tuition assistance for low-income families. The program, really helped me because in the beginning I was paying $800 a month for them to go to school. And with the program, that's -- I usually get 50 percent, so I pay $400 a month, it makes a big difference. NARRATOR: Kashaun is in sixth grade at the Nannie Helen Burroughs School in the northeast section of Washington. I chose Nannie Helen Burroughs, even though it wasn't in our neighborhood, because it was a Baptist school and we're Baptist. Shirley Hayes: " Good morning. Good morning. Good Morning." NARRATOR: Shirley Hayes, a former principal in the Washington, DC, public schools is now the head of Nannie Helen Burroughs. When I came to this school in 1993, I came here just to be interim principal for six months. That was seven years ago. Mrs. Hayes: "I'm glad to see your tie on, Denzel." SHIRLEY HAYES: I know all of my children. I know them by name. I don't have to go to a file cabinet to look up information. I know them. NARRATOR: Over the years, scholarships like those given to Kashaun Brown have helped many parents send their children to school here. My parents are hard working middle income, some lower income folks who want better for their children. And they're given the opportunity to look around at the private schools and make their own choice about where they want their children to come. The money that is provided helps them to accomplish their desires. No matter how poor people are, they want better for their children. NARRATOR: Some argue that students should be able to use public money - tax dollars -- to get a private education. This approach, often called "school choice" or "vouchers" - is enormously controversial and has been tried only on a limited basis. But private philanthropy has a way to test the idea without getting embroiled in politics. NARRATOR: The Washington Scholarship Fund, which helps Kashuan and Kastacia attend private school, was started back in 1993. It now offers scholarships to almost 1300 children in more than 100 DC-area private schools. Daniel Labry is the program's executive director. DANIEL LABRY: The success of our program has brought us to a point where about one in every ten students in the private school market is receiving support from the Washington Scholarship Fund. The majority of our students are African American, the next highest percentage are Latinos, and they are your typical low-income families. NARRATOR: Those families make an average of $17,000 a year. Nearly three-quarters of the program's students are from single-parent homes. Most students - about 70% - choose to attend Catholic schools. The scholarship fund's tremendous growth has been driven largely by two men: John Walton, an heir to the Wal-Mart fortune, and Ted Forstmann, a billionaire financier. In 1997, the two made commitments to the fund of $3 million each and Forstmann became chairman of the program's board of directors. You can't equalize height, weight, you know, how nice your mother was to you or anything, but if you have an equal opportunity at a quality education in today's world, you've gone a long way towards providing equal opportunity. And that's what I want to do. NARRATOR: Ted Forstmann is the founder of a New York leveraged buyout firm. He has made a fortune investing in companies and helping them become more profitable. For years, Forstmann was a relatively low-profile philanthropist whose work focused on helping children, whether in America's inner cities or in war-torn Bosnia. But a meeting with the late Cardinal John O'Connor of New York City convinced Forstmann, himself a Catholic, to focus more closely on education. TED FORSTMANN: He said, "Before I'm a cardinal, I'm a priest, and the role of a priest is to be a shepherd. But I have decided that you are going to be one of my sheep." It was an enormous moment. It was a seminal moment. It was the beginning of my becoming so involved in education. NARRATOR: Forstmann began to see school choice as a solution to America's education problems. It was then that he turned to the Washington Scholarship Fund. So this was perfect for me because, in the first place, I could help 1,500 poor kids, and in the second place, possibly, I was going to see - I was going to make a point, which is one of the bits of conventional wisdom is that these parents - these are the poorest of the poor - don't care. I thought, "Well, I can kill two birds with one stone. We'll see whether they care or not." NARRATOR: The fund received 7,500 applications in Washington for 1,000 scholarships. Seventeen percent of the eligible low-income population applied. Perhaps the most amazing thing was just the sheer number of families that were very interested in participating in the scholarship fund program and having their kids attend private schools and their being prepared to make sacrifices so that their kids could get the best education possible. NARRATOR: In 1998, Forstmann and Walton took their initiative nationwide. They each put in $50 million to launch the Children's Scholarship Fund, or CSF. Video: Ted Forstmann: "John and I are underwriting a $100 million scholarship fund to be given out to poor inner city children around America." NARRATOR: One and a quarter million children applied. In some cities, more than a third of eligible low-income families sought scholarships. CSF awarded about 40,000 scholarships in all. Forstmann had, in effect, begun a nationwide school choice program. By using his own money, he thought he could sidestep controversial politics. TED FORSTMANN: To me, it's a moral issue. And it is a political issue. I'm not approaching it that way because I think you get into gridlock. What I'm doing is saying, you know, anybody that wants to join us because they know that this is the civil rights issue of the day - and there are civil rights leaders that have joined us and so on - should do so. NARRATOR: Among those who gave Forstmann a letter of support was Los Angeles Mayor Richard Riordan, himself a longtime philanthropist and someone well-acquainted with the problems of America's urban public schools. RICHARD RIORDAN: I think what Teddy Forstmann is doing, in a sense having - if you want to call it a private voucher or a private scholarship system, which nobody can object to - I think that's a perfect way to do something. It can show us whether this type of thing works. And if it works, if the kids are helped by it, why not do experiments with public vouchers? DINESH D'SOUZA: I think that philanthropy has some advantages over government allocation, and one of them is that while the government, in a sense, has got to put up its programs for public referendum, or debate, or adjudication, the philanthropist, in a sense, gets to bet on his own horse. NARRATOR: But for Forstmann, what began as an attempt to use philanthropy to get around politics has become an overt political crusade. In April of 2001, Forstmann launched Parents In Charge, a national campaign to promote school choice with public dollars. Forstmann saw that charitable giving alone could not do the job. This became clear to him when he offered scholarships to fill every open seat in New York City's private and parochial schools. TED FORSTMANN: Last year, we offered to fill every single - every single - available seat in New York City. We have 168,000 poor children on the waiting list. There are no seats because this system is very good at one thing and that's keeping all alternative suppliers out of the market. There are no seats. NARRATOR: Forstmann argues that even his millions were not enough to create competition in education. He had run up against the limits of philanthropy and confronted politics. TED FORSTMANN: I still have all my charitable impulses and so on and I'm very happy we're doing what we're doing, but I've become something of a revolutionary at the same time. So Ted Forstmann is now moving toward public argumentation and he is not alone. There has been a bull market in The Arguing Business, most of it funded by philanthropy. Is this good? I am a fellow here at the American Enterprise Institute, AEI, regarded as right-of-center on the political spectrum. But in Washington D.C., there are 135 policy think tanks and they are as diverse as all America: hawkish, dovish, pro-life, pro-choice, pro-nuke, anti-nuke, pro-voucher, anti-voucher, pro-regulation, anti-regulation, free trade and protectionist. And so, scholars are often working at cross-purposes. There has even been combat about the combat within this community. BEN WATTENBERG: Conservatives say that many of America's biggest foundations use their deep pockets to promote liberal ideas like environmentalism and racial preference -- sometimes actually against the views of the original donors. Liberals say the conservative foundations may indeed be smaller, but they have been getting more bang for their buck. How so? Well, liberal foundations often support programs on the ground while conservatives are more likely to fund research at think tanks that support ideas such as free markets and a muscular foreign policy. If you believe that progress is most likely to emerge from a brawling marketplace of ideas, then yes, this kind of philanthropy is indeed a good thing. Our next givers have a different twist on ideas; they are applying ideas of the business world to their giving. These so-called "Venture Philanthropists" are young, wealthy, and engaged in putting their dollars to work themselves. NARRATOR: Just outside of Seattle some wealthy former tech world executives are donating their time and money to programs like the one here at Talbot Hill Elementary School. The students are part of an experimental teaching approach called Ventures. For 45 minutes, 3 times a week, the students take on real-world jobs: They make products, sell them at market, and pay taxes, all as a part of a miniature society complete with its own currency called "cool cash." Student #1: "Um, so if you need help with an article, come up to me or Robin afterwards. OK? Rachel?" Student #2: "Um, could you . . .? " NARRATOR: There is a court system with mediators to settle disputes, a student government and a watchful media. Student newscaster: "Welcome to Talbot Hill School and the first broadcast of KATS TV for the year 2001." NARRATOR: It may look like play time, but the kids are satisfying specific state learning goals without even knowing it. Student #1: "How much did you sell?" Student #2: "I sold a hundred dollar. " The changes that I've seen in the students are that they are taking a far more active role in their learning. They realize that they are responsible for their own education and the opportunities that they have before them. NARRATOR: You might not know it to look at Ventures, but what's really different about the program is how it's funded. Though Ventures is part of a public school curriculum, the money for the program comes from a group of private philanthropists in Seattle called Social Venture Partners. Video: Paul Brainerd: "Because I've been in the publishing business for nearly 20 years . . . "
NARRATOR: SVP Seattle was founded in 1997 by software pioneer Paul Brainerd. Brainerd, the creator of the popular desktop publishing program PageMaker, sold his company Aldus to Adobe in 1994. He took his share, estimated at close to $120 million dollars, and said goodbye to the world of software. PAUL BRAINERD: In the SVP model it's a very personal engaged style of giving, where the giver and the receiver both have to work in partnership in a true sense of that word. They need to be able to develop trust over a number of years to really understand what the problems are in the community, and how they can best work together, not only giving money, but giving time and expertise, sitting down writing what I would call a business plan to look out over a longer time horizon - say four, five, or six years - of how we're going to take an organization from this level to this level, in the same way that a venture capitalist would look at a new enterprise. NARRATOR: Since 1997, SVP has given out grants totaling $3.4 million to 28 non-profits serving children, education, and the environment in the Seattle area. That's not a lot of money as these things go; but what makes these venture philanthropists different is not necessarily the money. Last year SVP's members volunteered over 10,000 hours helping organizations like Talbot Hill. The grants and volunteer time focus on building up the non-profit organization behind the program. I don't think we're anywhere close to the first organization to think about this. A lot of foundations have begun to think about not just the program. Not to take the approach that says, I want 100 percent of the money just to go to the program that they're creating today. And to step back and think, what about the long term? What about the staff? Which is really what runs nonprofits. What about their infrastructure? All of the things that have, you know, kind of spurred American productivity in the 90s. NARRATOR: SVP is made up of nearly 300 "partners": people like Keith Rowe, a former Microsoft employee who had directed the launch of MSNBC.com. KEITH ROWE: When I first joined Microsoft -- you're originally granted options - and, you know, one day you're excited because, "Oh, I could have bought a couch today." And then, you know, you wait a little - another year - and you look at the amount at the bottom of the list and it's "Oh, I could have bought a car today." And then you look at the list and say, "Wait a minute. I could buy a house today." And then one day I just looked at it and said, "You know, I don't actually have to come in to work anymore." And in a way that changed the way I thought about my work, but it also changed the way I thought about my life. NARRATOR: Keith is the lead partner from SVP working on the Ventures project at Talbot Hill Elementary School. Unlike most traditional foundation grants, SVP made a 3-5 year commitment to support Ventures with both money and volunteer time. SHERYL DUNTON: So, it isn't just the money - which is wonderful, the financial support has been, you know, extremely crucial; but also, it's their support to really see us grow as an organization and to look at how we support ourselves, and the things we need to do to work smarter and to think a little bit differently. NARRATOR: Dawn Trudeau is another former Microsoft executive who hit it big. She was one of the original three-person team to launch a little software program called Excel. After 14 years with Microsoft Dawn decided to leave the company and get personally involved in giving. Through Social Venture Partners, Dawn works with a mentoring program for minority girls called "Making Connections." When I was a hiring manager at Microsoft, it's difficult to find a real wide variety of people. I would have loved to hire more women. I would have loved to hire more minorities. But there wasn't as many candidates as I would have liked to have seen. And so, one of my personal passions is to try to build that feeder pool, make it so that more and more women and more and more people of color can take advantage of that great economic opportunity. NARRATOR: Janika Hillis is one of those women. Her mentor Bridgette Paul, helped Janika search for college scholarships and kept her on track through the entire application process. Bridgette Paul: There are a lot of scholarships in here. NARRATOR: In a way, the approach of groups like Social Venture Partners is as much a return to the age of Carnegie's "Gospel of Wealth," as it is a revolution in giving. RON CHERNOW: My impression is that many of the young venture philanthropists today imagine that they are rebelling against the precedents set by Rockefeller and Carnegie and the other moguls of the gilded age. In fact, in many ways they're following exactly in their footsteps. Rockefeller constantly talked about the business of benevolence. He and Carnegie imagined that they were transferring all of these valuable lessons from the business sphere to the philanthropic sphere. NARRATOR: Carnegie and Rockefeller used their wealth to build large-scale institutions from scratch. What is new is that groups like SVP are trying to support small, non-profit startups, what venture philanthropists call, "social entrepreneurs." PAUL SHOEMAKER: A lot of these folks, they're entrepreneurs in a social context, and just like a lot of us have recognized what a software or a small business entrepreneur looked like when they went from the seed of an idea to an organization that could truly grow and support - could scale what they're doing - we think we can help bring that same set of skills to a nonprofit organization. You know, it may sound silly and it may sound trite, but that is how you make the world a better place. If we all can turn around and help a couple of other people, eventually things will be better than they are now. The SVP model is being adopted in at least 14 other cities, part of the new tide of philanthropic wealth that is washing across America. Now this is not a situation without problems. Much of that money comes from the very rich, with a tax break for the givers; it's spent with very little public accountability, often in perpetuity, some of it at cross-purposes. Still, there is great hope that comes with this trend. Concentration of Wealth with freedom to use it freely, has done some wondrous things in America. And there's more such charitable wealth coming, much more. There will be more givers like Gates, Forstmann, Milken and the Seattle partners, able to tackle big problems in their own way, as did Carnegie and Rockefeller. I think it will work out pretty well. For Think Tank, I'm Ben Wattenberg. NARRATOR: To learn more about Think Tank with Ben Wattenberg, visit PBS online at PBS.org.